Russian cosmonaut and Expedition 56 Flight Engineer Oleg Artemyev video-chats with his wife and daughter from the International Space Station. NASA astronauts Ricky Arnold and Drew Feustel and Russian cosmonauts Oleg Artemyev and Sergey Prokopyev (four of the six crewmembers currently aboard the space station for Expedition 56) all have kids back on Earth. Each of the four dads aboard the space station has two kids back on Earth. Artemyev, who launched on March 21 along with fellow "space dads" Feustel and Arnold, left behind his 6-month-old daughter and an older son when he blasted off into orbit. 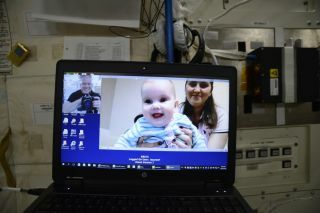 Despite having lived on the space station for almost three months now, Artemyev still keeps in touch with his family via regular video chats. In photos Artemyev shared on Twitter, his infant daughter looks delighted to see his face — albeit on a computer screen. Feustel's two sons and Arnold's two daughters are all young adults. One of Feustel's sons just graduated from college this spring, and the astronaut beamed his congratulations to Earth from space via Twitter. These three dads will have spent six months and 13 days in space before returning to Earth on Oct. 4. Prokopyev, who arrived on a different Soyuz nine days ago, still has another six months left during Expeditions 56 and 57. He has one son and one daughter, according to spacefacts.de. Russian cosmonaut Oleg Artemyev holds his infant daughter at the Gagarin Cosmonaut Training Center in Star City, Russia, a few weeks before he and his Expedition 55/56 crewmates lifted off to the International Space Station on March 21, 2018. To his right are his wife and son, who is holding hands with NASA astronaut Drew Feustel. On the left is NASA astronaut Ricky Arnold. The other two astronauts who flew to the International Space Station with Prokopyev are not dads, but NASA astronaut Serena Auñón-Chancellor (the only woman currently in space) has a daughter and a husband back on Earth. German astronaut Alexander Gerst of the European Space Agency is the only current crewmember who has no children.